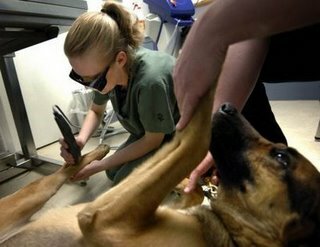 Laser Therapy uses “cold” laser light of low intensity to stimulate tissues to heal. Healing occurs by a number of physiologic mechanisms. Laser light dilates blood vessels in the area of application. Dilated blood vessels can carry de-oxygenated blood away and bring in freshly oxygenated blood faster. The departing blood will also carry away deleterious by-products of injury and bring in fresh cellular nutrients, allowing cells to rejuvenate faster. Lymphatic vessels are also dilated, allowing edema-forming lymph fluid to escape injured tissues, reducing swelling. This reduces pain. Laser light desensitizes local nerves so that they cannot fire as quickly, thereby sending fewer pain signals to the brain. Healing tissue fibers called collagen align themselves in a more linear, uniform, “normal” direction when exposed to laser light, reducing scarring and improving the tissue strength of newly healed wounds faster. Bacterial growth (and probably viral reproduction) are inhibited by exposure to laser light, making laser treatment helpful in treating non-healing wounds, contaminated wounds and burns. Laser light stimulates the “battery pack” of cells, called mitochondria. The mitochondria can then produce more ATP, which helps cells do more work. Cells can then get rid of biologic waste products more quickly and efficiently. They can heal and turn over depleted by-products faster. They can also reproduce faster, resulting in faster healing. If your pet has any of these conditions and you would like to offer him another form of relief and a faster road to recovery, Call Us to schedule your consultation to find out how laser therapy can help maximize your furry family-member’s quality of life. Visit our contact us page to setup an appointment.